The General Meeting of Shareholders of Sif Holding N.V. will be held on Friday 3 May 2019 at 13:00 hours in TheaterHotel De Oranjerie at Kloosterwandplein 12-16, 6041 JA Roermond (telephone +31 475 391 491). Sif presented 2018 annual results on 21 March 2019. Attached please find slides for the webcast presentation. We herewith present you our 2018 annual report as an attachment. The new facility expires 22 February 2022, with two one-year extension options. The facility consists of a revolving credit facility of € 100 million and a committed guarantee facility of € 250 million. The previous arrangement had a revolving credit facility of € 90 million with committed guarantee facilities of € 160 million. The increase in facilities serves to support SIF's future business. Margins and commitment fees remain unchanged at Euribor plus a surcharge that depends on the leverage and solvency on a quarterly basis. The new leverage (net debt/EBITDA) should be equal to or less than 2.5 (was 1.5 under the expiring facility) and the solvency should be equal to or more than 30% in 2019 and 35% during the years beyond 2019. . The financing arrangement has also been made sustainable. Sif can earn discounts of max 0.05% if certain sustainability KPI's are reached. Leon Verweij, CFO: "This amended and broader facility provides sufficient flexibility to pursue our strategy going forward. This new agreement assures Sif a financing structure that fits the characteristics of our Company." Roermond, the Netherlands, 31 January 2019. After meeting the relevant criteria for three consecutive years, Sif Holding N.V. will become subject to the large company regime (volledig structuurregime) as from 1 February 2019. The large company regime allows employees to have a say in the appointment of supervisory board members and certain power is shifted to the supervisory board in accordance with the Dutch Civil Code. Dutch law requires that a large company conforms its articles of association to the rules applicable to large companies. The articles of association of Sif Holding N.V. already allow for the consequences of Sif Holding N.V. becoming subject to the large company regime. The articles of association that apply as from 1 February 2019 are available on the company's website and as an attachment to this press release. Richard Jongen, Commercial Manager Wind Sif: "This is the first time Sif is going to manufacture the offshore foundations for a wind project on behalf of Ørsted. With our new assembly facility and state-of-the-art deep-sea quay on Maasvlakte II (Port of Rotterdam), Sif is ideally located and perfectly equipped to efficiently produce and deliver the monopile foundations. Sif is very pleased to contribute to a successful offshore wind project off the Dutch coast such as Borssele I-II." On 24 August 2018 Sif released interim 2018 earnings. The results were explained by the executive board during a webcast analyst presentation. Fred van Beers nominated for appointment as new CEO of Sif Holding N.V.
Roermond, The Netherlands, 10 July 2018. The Supervisory Board of Sif Holding N.V. will nominate Fred van Beers for appointment as the company's new CEO effective 1 September 2018 at the General Meeting of Shareholders to be held on 31 August 2018. The Works Council has been informed and requested to provide advice. Sif's Annual General Meeting of Shareholders is scheduled for 3 May 2018. Attached please find the Notice and the Agenda for the Meeting. Today Sif released Q4 and FY 2017 earnings. The results were explained by CEO and CFO during a webcast analyst presentation. Attached please find the slides that are used at this presentation. Please find attached Sif's Annual Report 2017. Roermond (the Netherlands), 13 March 2018 Sif Holding N.V. ("Sif", or the "Company") today announces that Jan Bruggenthijs will not be available for reappointment as CEO and member of the Executive Board. Mr. Bruggenthijs (60) will step down for personal reasons upon the end of his current term at the close of the Annual General Meeting of Shareholders (AGM) on 3 May 2018. Mr. Bruggenthijs has been CEO and member of the Executive Board since September 2014. The Supervisory Board would, on behalf of the Company, like to thank Mr. Bruggenthijs for his endeavours and wishes him all the best. Under his leadership, Sif has reinforced its leadership position as a manufacturer of foundations for offshore windturbines and oil & gas equipment. The Supervisory Board has begun the process of finding potential candidates to fill the vacancy that will arise following the end of Mr. Bruggenthijs' term. Roermond, 22 February 2018. The Supervisory Board of Sif Holding N.V. will nominate Mr Peter Visser and Mr Peter Wit for appointment as members of the Supervisory Board at the General Meeting of Shareholders to be held on 3 May 2018 in Roermond. Peter Visser (1956), Dutch nationality, was appointed ad interim on 1 November 2017. The Supervisory Board appointed him following the sudden resignation of Alexander van Wassenaer in October 2017. Peter Visser represents major shareholder GKSE Holding B.V. on the Supervisory Board. He co- founded investment fund Egeria in 1997. From 1992 until 1997 he was managing director at MeesPierson N.V. and responsible for their private equity activities in Europe. From 1983 until 1992, he worked for McKinsey & Company and founded his own consulting firm Management & Investment B.V.
Peter Wit (1967) Dutch nationality, COO at Atlas Services Group. From 1992 until 2009, he worked at Shell amongst others as VP Finance at Shell Solar and as COO & Finance manager at Shell Asset Management Company. From 2009 until 2013, he was CFO at Dockwise Ltd. From 2013 until he recently joined Atlas Services Group, he was CFO at Inashco. Peter Wit will be nominated as successor for Maarten Schönfeld who recently indicated he is not available for reappointment. Extended personal data resumes will be available at the Company's offices from 15 March 2018. Roermond (The Netherlands), 29 January 2018. Sif Holding NV announces that Mr Maarten Schönfeld has stated he will not be available to serve another term as Member of the Supervisory Board of the company when his current term ends at the close of the Annual General Meeting of Shareholders (AGM) on 3 May 2018. Maarten Schönfeld joined the Supervisory Board in 2016 for a two-year period during which he would focus mainly on supporting the company following its listing on Euronext Amsterdam in 2016.This period will end at the close of the 2018 AGM. The Supervisory Board has begun the process of finding potential candidates to fill the vacancy that will arise following the end of Mr Schönfeld's term. Supervisory Board Member a.i. Sif Holding N.V.
Roermond, 1 November 2017. Following the resignation of Alexander van Wassenaer from the Supervisory Board of Sif Holding N.V., Peter Visser is appointed a Supervisory Board member as of today on an ad interim basis. Peter Visser (1956) represents major shareholder GKSE Holding B.V. on the Supervisory Board until a successor is nominated and appointed by the Annual General Meeting of Shareholders scheduled for 3 May 2018. Peter Visser co- founded investment fund Egeria in 1997. From 1990 until 1997 he was managing director at MeesPierson N.V. and responsible for their private equity activities in Europe. From 1983 until 1990 he worked for McKinsey & Company and founded his own consulting firm Management & Investment B.V.
Roermond, 23 October 2017. Alexander van Wassenaer resigns with immediate effect from the Supervisory Board of Sif Holding N.V. for personal reasons. Alexander van Wassenaer represented major shareholder GKSE Holding B.V. on the Supervisory Board and was first nominated in January 2016. The Supervisory Board of Sif will engage in procedures to propose a successor on the Supervisory Board for nomination at the Annual General Meeting of Shareholders scheduled for May 2018. The Management Board and Supervisory Board would, on behalf of the Company, like to thank Alexander van Wassenaer for his contribution to the development of Sif from a private into a public company and wish him success in his future career. Roermond, the Netherlands, October 2, 2017. 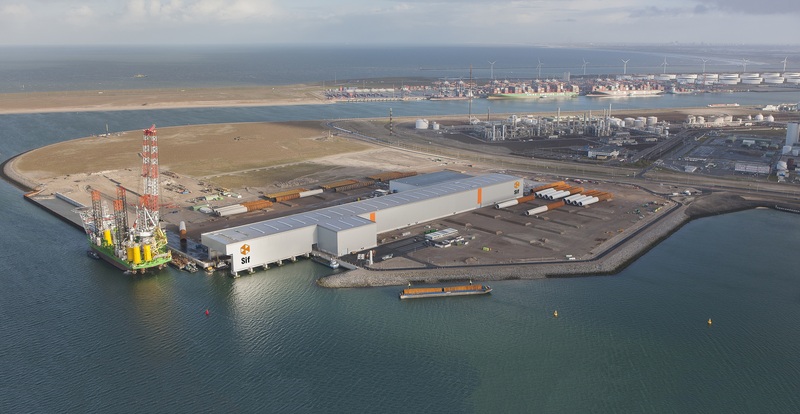 The Dutch Minister of Economic Affairs, Henk Kamp, on Friday officially opened the new assembly and coating facility operated by Sif Holding N.V. at Rotterdam's Maasvlakte 2 terminal. The new facility will increase Sif's annual capacity from 225 kilotons to 300 kilotons. 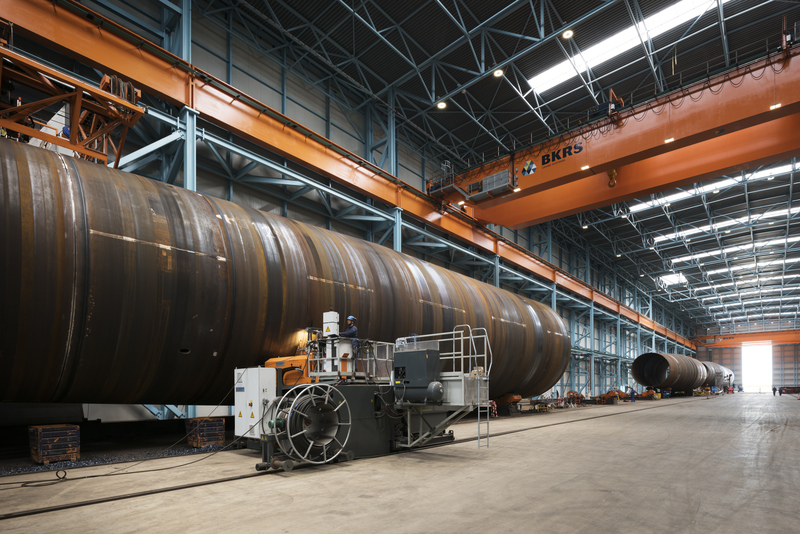 Components manufactured at the Roermond site can be assembled at the Rotterdam facility into complete monopiles with a diameter of up to 11 meters, a length of 120 meters, and a weight of around 2,000 tons. Once the complete monopiles have been coated in the four separate blasting and painting rooms, they are stored on the facility's 103-acre grounds until delivery via the specially constructed quay. The grounds can accommodate the simultaneous loading of two installation ships of monopiles and transition pieces. The facility is currently equipped with two fully operational production lines, which have the capacity to produce four complete monopiles per week. In his officiating speech at the opening ceremony, Dutch Economic Affairs Minister Henk Kamp expressed his admiration for the groundbreaking efforts by Sif to develop offshore wind energy as an energy source: "As a family-owned business with solid roots in Limburg province, Sif has undergone remarkable growth and development and helped to ensure that the need for subsidies for building offshore wind turbines will be eliminated within the next few years. This means we are on track to become a low-carbon society." In his speech, Port of Rotterdam CEO Allard Castelein stated his hope that the Minister would be able to translate the objectives of the sustainability sector into a long-term vision for further advancing the development of wind as a source of energy: "Wind energy is a perfect example of a win-win situation. In addition to resulting in cleaner energy consumption, creating jobs, and generating revenue in a whole new segment of industry, it also attracts many related businesses looking to settle in this area." Sif Holding N.V. CEO Jan Bruggenthijs expressed his pride at the successful completion of the project and explained the significance of the new facility in his speech: "This is a perfect representation of the goals that Sif is committed to. We continue to focus on reducing the costs of the construction of offshore wind farms. We do this not only by applying the cost leadership concept to the use of ultra-modern production resources but also by constantly reducing costs in the total value chain. Together with our clients and offshore wind-farm developers, Sif will continue searching for further cost optimization and supporting the possibility to create wind farms without subsidies." The project took a total of approximately 30 months to complete, from the signing of the partnership agreement between Sif and Port of Rotterdam in March 2015 and the launch of production in September 2016 up to and including the commissioning of the second production line and the facility's official opening this year. The operation coincided with the upgrade of the production facilities at Sif's Roermond site. This marks the completion of an investment program involving an amount of roughly € 90 million, created by Sif to enable offshore wind-farm managers to start using a new generation of wind turbines with larger capacities. Roermond, the Netherlands 20 September 2017. Sif Holding N.V. announces that Triton Knoll Offshore Wind Farm Ltd and a joint venture of Sif Netherlands B.V. and Smulders Projects Belgium N.V. have signed Preferred Supplier and Early Works Agreements for the design and fabrication of 90 monopiles and transition pieces as well as 2 foundations for offshore substations. The estimated total weight of Sif's part of the project is 56 Kton. Triton Knoll is an offshore wind farm developed by a joint venture of Innogy Renewables UK Ltd and Statkraft AS, located 32 km off the coast of Lincolnshire and 50 km off the coast of north Norfolk. The project will have an installed capacity of 860 MW and will use MHI Vestas' V164-9.5 MW turbines with a maximum tip height of up to 187 m. The project plans to install 90 wind turbines, 2 offshore substations, 1 onshore substation, associated inter-array cables and export cables that are routed both offshore and onshore. The engineering and design for the project will start before the end of the month of September 2017 based on an Early Works Agreement. Fabrication will start in the first quarter of 2019 following the Financial Closure of the project, which is expected to be halfway 2018. Roermond (The Netherlands), Taoyuan City (Taiwan) 14 September 2017. Sif Netherlands B.V. and Century Wind Power Co. Ltd announce their intention to join forces for the Taiwanese offshore wind market. The Taiwanese offshore wind market is developing rapidly and the Taiwanese government's renewable energy policy aims to achieve a status of "non-nuclear homeland" by the end of 2025. The goal is to install 3 GW of offshore wind capacity by 2025. Century Wind Power Co. and Sif want to contribute jointly to this ambitious target. Roermond, 1 September 2017. COO Luc De Proost (57) has announced his intentions to leave Sif- group ("Sif" or "Company") to pursue his career outside the company. Mr. De Proost has been the COO of Sif since October 2015. Mr. De Proost will leave Sif once the Company has engaged a new COO. The management and supervisory board would, on behalf of the Company, like to thank Mr. De Proost for his contribution and achievements over the last period and wish him success in his future career. Sif is a leading manufacturer of large steel tubulars which are used as foundation components for the offshore wind and offshore oil & gas markets. The Company manufactures customised tubular components for offshore foundations, predominantly in the greater North Sea region. Sif combines a highly automated and flexible production facility with technology leadership in rolling and welding of heavy steel plates which is based on over 66 years of experience and innovative in-house developed techniques and processes. Sif primarily produces monopiles, transition pieces and piles that are used to anchor jacket foundations in the seabed for offshore wind turbines, as well as legs, pile sleeves and piles of the larger jackets for oil & gas as well as tubular structures for various uses such as jetties. Sif is listed at Euronext Amsterdam. More information about Sif is available electronically via the website of Sif: www.sif-group.com. The order book and the pipeline are the main performance indicators for the future. Projects such as Albatros and Borkum II have increased our order book for 2018 to 109 Kton. Other projects, including St Nazaire and Courseulles in France and Fryslan in the Netherlands, scheduled for 2018 have been shifted to 2019 primarily relating to environmental issues. Some projects, such as Borssele in the Netherlands, have been pushed back for other reasons. With annual capacity of 300 Kton from 2018 and only few remaining opportunities for production in 2018, we anticipate some underutilization of production facilities, which demonstrates the volatility of the project-driven industry of which Sif is a part. Momentum for offshore wind has, however, accelerated with unsubsidized contract wins, decreased LCOE for offshore wind in Europe, increasing interest in the United States and the Far East and contracts for the first projects for 2019 under negotiation." 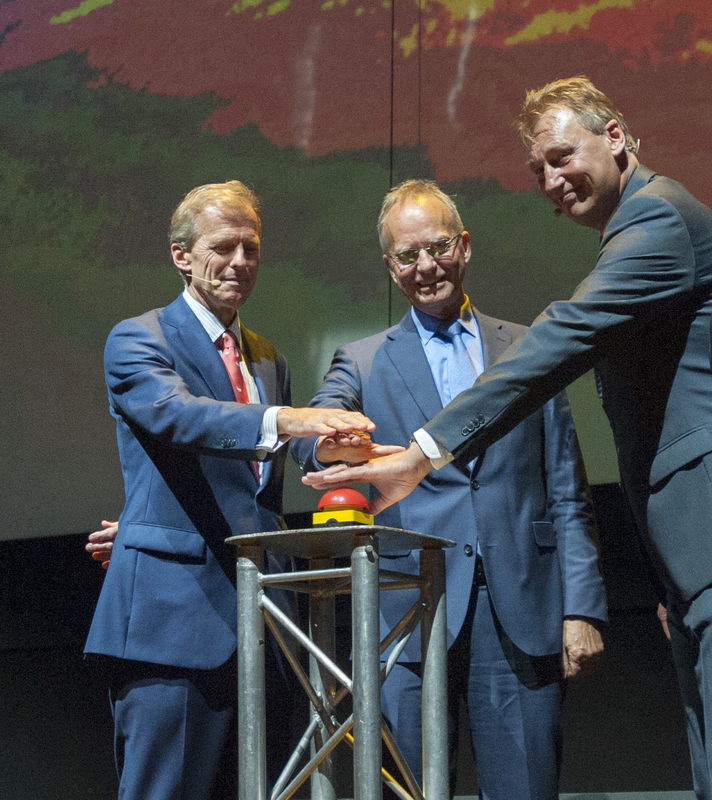 Sif announces the completion of the first monopiles in the new assembly facility at Maasvlakte II in Rotterdam. Sif announces the award for the production of pin piles for the Beatrice offshore wind farm.